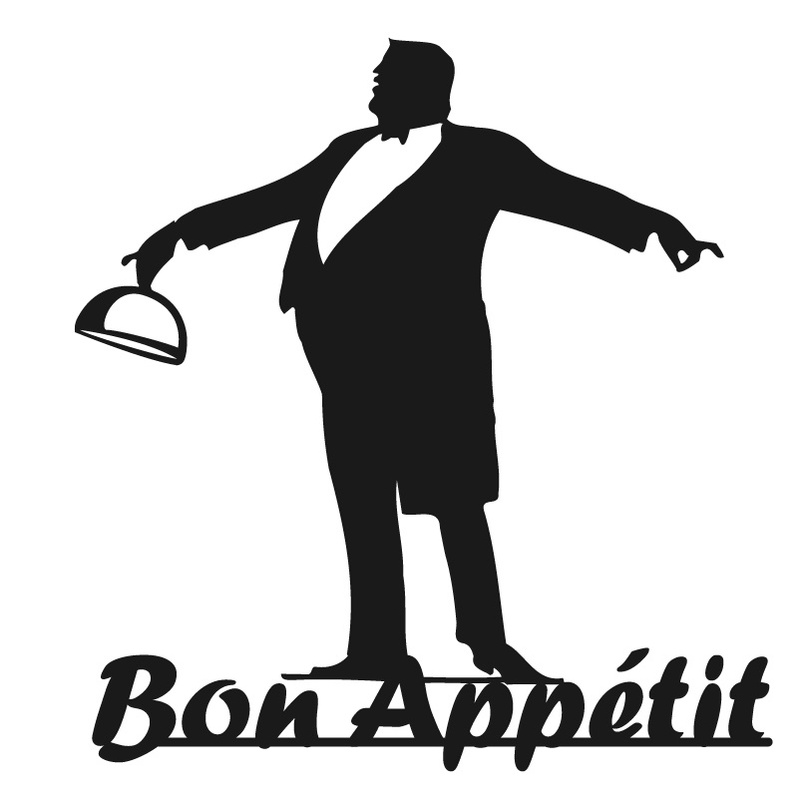 On a rainy Thursday night a friend and I debated where dinner should be. We wanted close, inexpensive and not chain if possible. 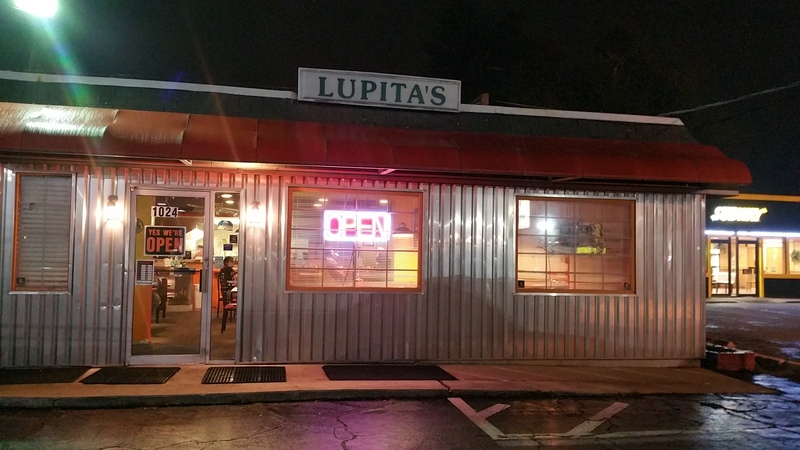 We did a quick social media search and found Lupita’s. Reviews were good, pics interesting and it was close to both of us. I have eaten here but it was so long ago, I had no recollection of my experience, and she had never been here. This restaurant has been here at least 10 years that I know of, it was once painted a strange grape color, now a nice new facade of aluminum or something similar brightened up the look. The interior not as updated. 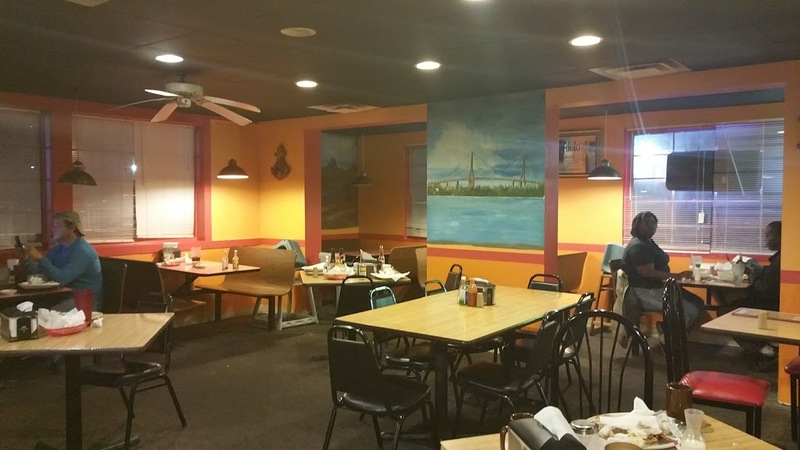 Basic restaurant furniture, few decorations, well lighted with an open kitchen. I can do plain, what I don’t do is messy. There were several tables, needing busing, and when I arrived only 3 of the tables were clean. I had to come off this after, I realized that only two people were staffing the entire space. The husband and wife owner were running the entire show. I did remember this from my previous visit. This couple very nice, doing their best to provide authentic, inexpensive food to a loyal following. 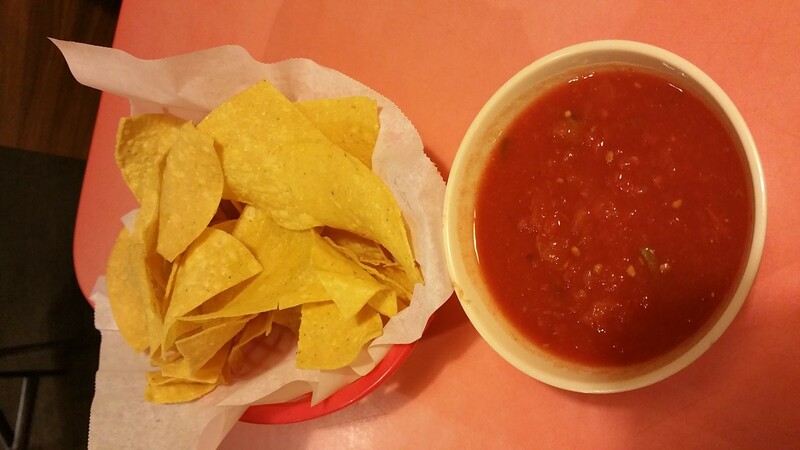 When my friend arrived, and we had our drinks and menus, we were served the standard Chips and Salsa. Now I like both of these items, sadly the chips basket contained what appeared to be some crispy chips and some very soggy, dull chips. We picked our way through the basked for the prized crispy. Salsa was meh, no snap or hint of any heat, or flavor, it was like someone opened a can of diced tomatoes and spooned a small portion into a bowl. 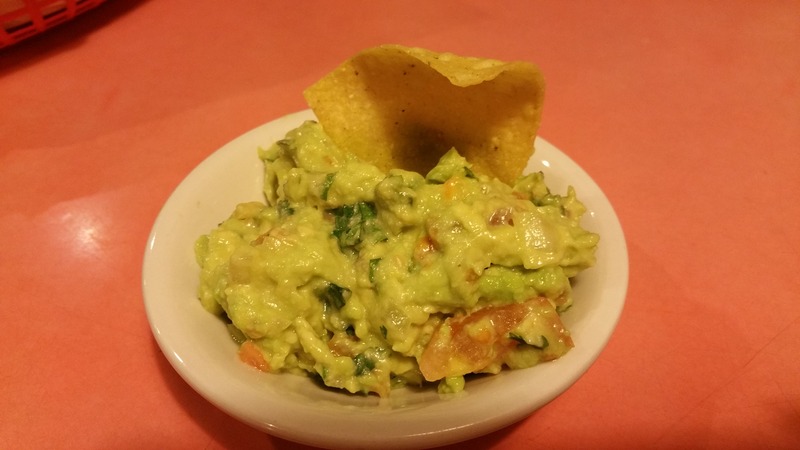 We chose the Guacamole to share, this arrived in a no frills dish which can be fine, but the food was no frills taste. It appeared to be freshly made, but flavorless. We stuck a chip in it for the photo. By now I don’t want to order anything else. The menu is very robust, with a generous array of fish and meat offerings, We both went basic, and that may have been our down fall. 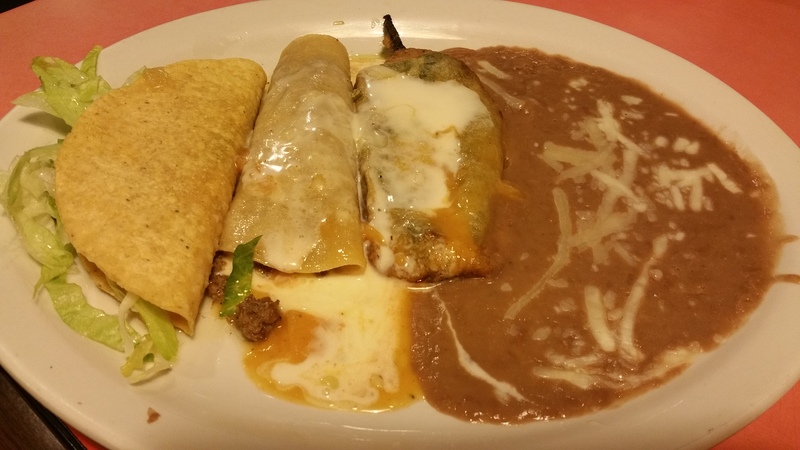 We each ordered the combo plates, one with chicken taco, enchilada, rice and beans, the other chicken taco, enchiladaa and chili rellenos, beans. I certainly can get past the unappealing presentation, of food just spooned onto the plate, prison style, what was unsettling was that everything tasted the same. Taco, chicken and lettuce but no other stuffing, the only sauce available to spruce it up was the salsa from the chips or a choice of a red of green condiment on the table. The green condiment was so green it looked radioactive. I tasted it and prayed for life. It may have passed its sell by date, I left the red bottle alone. 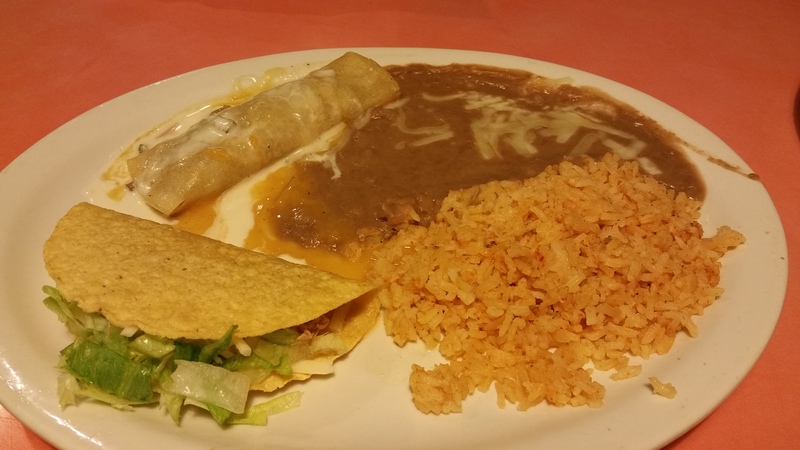 All the cheese had escaped the enchilada so I was left with a soggy tortilla, the chili same, cheese running out onto the plate, and only the fibrous pepper remained. Actually the pepper did have some flavor. Beans, well the picture speaks for it self, soupy runny and again flavorless, rice was also a disappointment. My friend left it on the plate. Condiment choices 1 empty, the green one scary green. 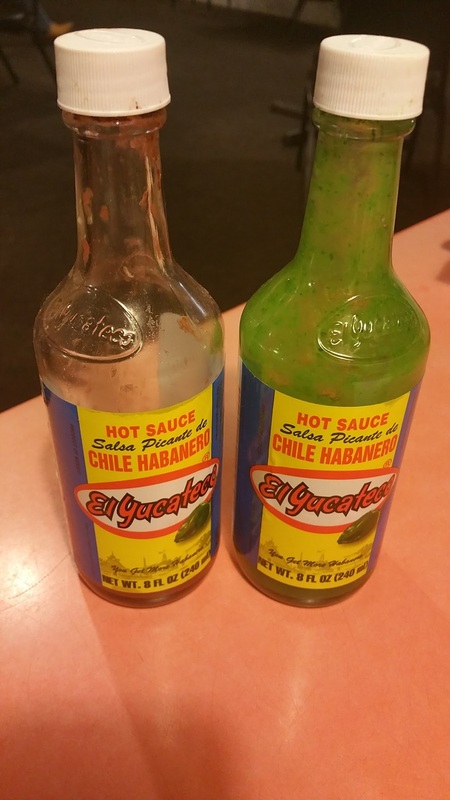 Both bottles need to be cleaned off. Now perhaps we just chose poorly, but I can’s see myself going back any time soon. The positives for this spot, it is a family run business, that has been in the same location for well like I stated 10 years that I know of, a loyal following, high marks on social media sites and a pricing that is sure to please. Make your own choices, and perhaps order one of the sizzling platters, anything but those combo plates.